With disc number five in the English version of Sailor Moon the story takes on a couple of new twists, as the band of young female warriors take on the forces of evil in the search for the moon crystals, gaining a couple of new allies in the process. There are some major revelations in store by the end, as we move into the next phase of the storyline. With his success limited thus far, Zoycite must pull out all the stops to reclaim the last of the moon crystals, which will allow Queen Beryl the power to unleash the Negaverse. His challenge is compounded by the fact that two of the crystals are in hostile hands, one with Sailor Moon, the other with the troublesome Tuxedo Mask. The disc starts off with a couple of pretty standard episodes, first with Serena getting jealous over Lita's attentions for Andrew, then with Raye's grandfather being targeted as a bearer of a crystal, but as a monk, he is more resistant to the dark side. This episode also introduces the valley boy rock star, Chad. The best of the early installments is Kitty Chaos, where Luna, who mysteriously becomes the target of every feline in town, finds a suitor in a huge cat who comes to her rescue. This is pretty hilarious. Queen Beryl's patience is wearing thin, so Zoycite decides that exposing the true identities of her foes is the answer, but these Negaverse characters aren't too bright when it comes to speculating, since they have a hard time connecting Sailor Moon—a blonde girl with meatballs in her hair—to Serena—a blonde girl with meatballs in her hair. However, when Malachite (our next major baddie) traps the Sailor Scouts, he is unprepared for the arrival of Sailor Venus and her feline sidekick Artemis. The final episode brings the second story arc of the series to a close as the final battle for the moon crystals gets underway, and the Sailor Scouts learn the identity of the Moon Princess. The final two episodes made this disc a bit more enjoyable than some of the more formulaic filler episodes have been, and set up the next leg of the story. With our Sailor Scout team complete, the girls face an even more powerful adversary, with a new spin to make their lives interesting. The series still concludes each show with a moral "Sailor Says" segment, some of which are a bit of a stretch from what happened in the episode, and really targets the younger audience. Sailor Moon is still light-hearted fun, if a bit too predictable. Good triumphs over evil, Serena learns a lesson, and the Scouts go on to battle the Negaverse another day. Image Transfer Review: Video quality remains consistent, if slightly improving here. Source defects are minimal, other than edit marks, and for the most part the image is clear and well defined. A couple of select shots look a bit out of focus, and there is a bit of grain evident. Colors aren't that vibrant, but are relatively solid with only minimal bleed. Typical aliasing, and a bit of rainbowing are also present. Audio Transfer Review: Audio quality remains strong throughout, with a decent bass response, good clarity, and easily discernable dialogue. There is limited directionality, but this is a solid, if not overly exciting soundtrack. Extras Review: Extras are limited to ADV previews for Princess Nine, Sakura Wars 2, Monster Rancher, Medabots, Ruin Explorers, Queen Emeraldas, and Nadia. Menus remain consistent in layout and operation as previous discs with a different background picture. Five chapters are in each episode, with only the first accessable from the main menu. 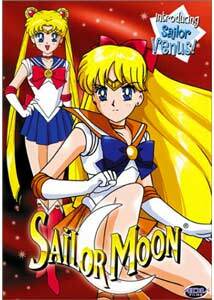 Another six action-packed episodes of Sailor Moon make their way to DVD in this English-only version. A couple of fillers round out some fun episodes, with the final Sailor Scout making her debut along with another talking cat as our next villian steps up to bat.